A spectacular fjord, a glacier and a small town at the mouth of the Bear River. Stewart in Canada. 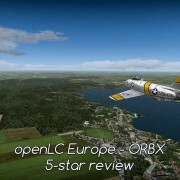 ORBX’s scenery is one of my favorite in FSX. What I like in Stewart Airport (CZST)? 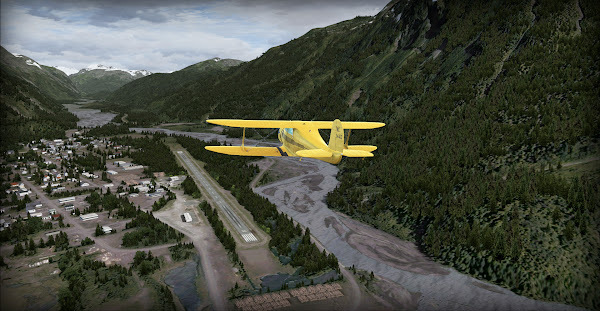 I have no idea what attracts me in Stewart – I started flying ther as soon as I got ORBX’s Pacific Fjords – even before I got the Stewart Airport scenery. There is something rare in the approach following the Portland Canal – I love to fly there. The topography of this area is interesting. 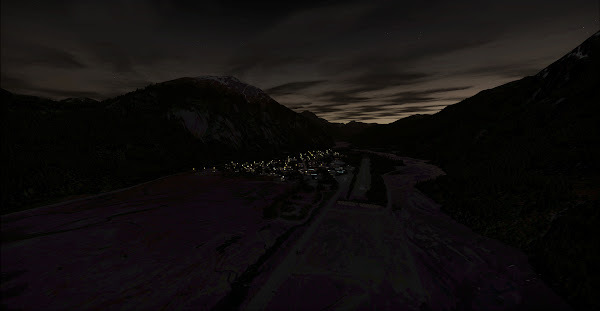 As is the airport itself – located in the narrow valley and challenging – just a bit. Stewart is a Canadian community at the border with Alaska. The area was colonized after gold and silver had been found in Yukon. Located at the far end of Portland Canal it was (and still is) an important harbor for the local logging companies and mines and it’s ice-free port can accommodate ships up to 50.000 tons. 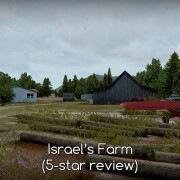 It also has good road links to nearby towns and an airport – which is the main subject of this review. Tourism is an additional source of revenue. King Edward Hotel (the only that is open all year around) is the biggest employer – 16 out of 380 adults living in this town work directly for this hotel. Visitors come to Stewart looking for secluded trails, heli-skiing slopes and cross country skiing routes. Stewart is also popular among hunters and anglers. Some statistical data. Stewart population is 500 inhabitants living in 165 households. If you would like to know more about the town – look up Wikipedia and Stewart website at HelloBC.com. 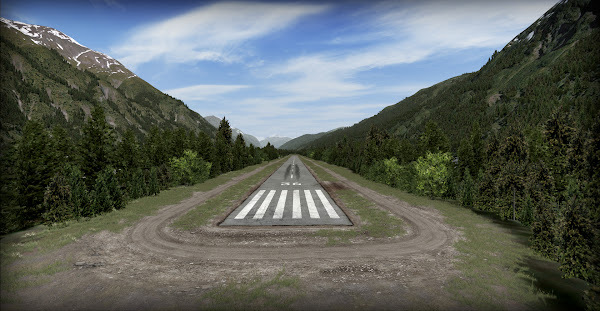 The airport has a single runway (18/36) that is 3900ft long and 75 wide. There are two or three aprons (depending on how you count them). Hangars provide the shelter from the elements – especially during winter. There are no lights on the runway and the airport has no navaids. The closes navais is the VOR at Annette Island – 76nm away and it’s not much of a help when flying to Stewart so keep your sectional handy or use a GPS to get here. In winter the runway is covered with snow. Traffic frequency is 123.2MHz. 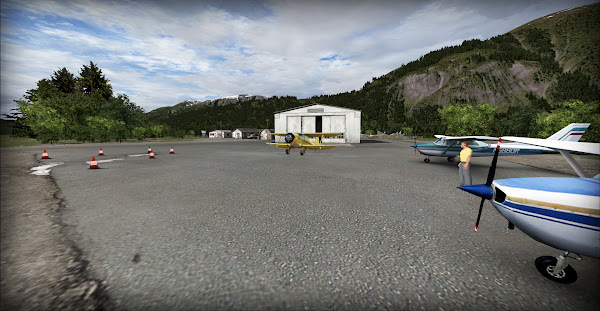 Stewart harbor hosts the Stewart Seaplane Base (CAC9). 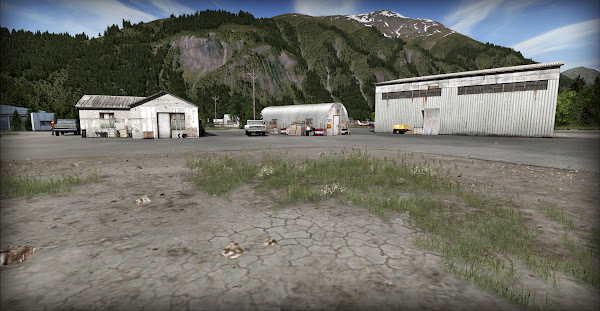 There is also a second seaplane base in nearby Hyder (4Z7) – in Alaska. Select something small. 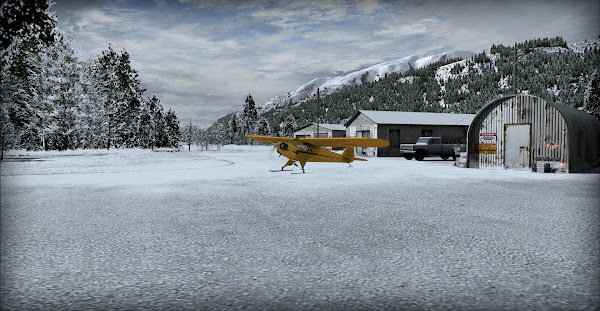 Cessna, Beaver and similar small planes are best suited for an airport like this. A small, local airlines could use Cessna 208 Caravan or a plane of similar size (Kodiak for example). 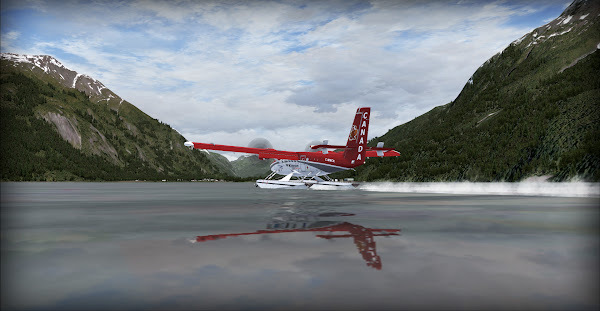 Twin Otter looks huge in here (although it is a good choice). Helicopters fit perfectly. And the seaplanes. I found no information about the real traffic at this airport apart from a short note that sightseing flights are available for tourists and heliskiing trip can be organized. 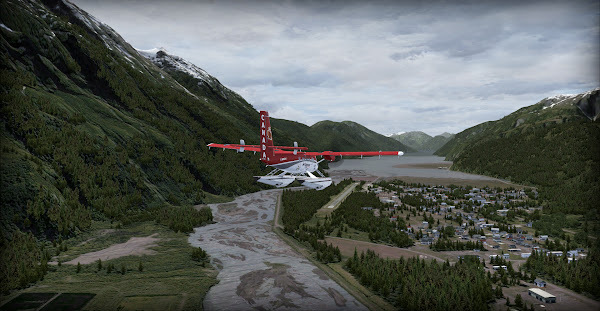 Based on what you can choose from FTX PFJ, Tongass Fjords and RTMM i recommend destinations like Prince Rupert (CYPR), Tarrace (CYXT), Meziadin Lake and Nass River (last two airports are located close to the B-36 crash site). 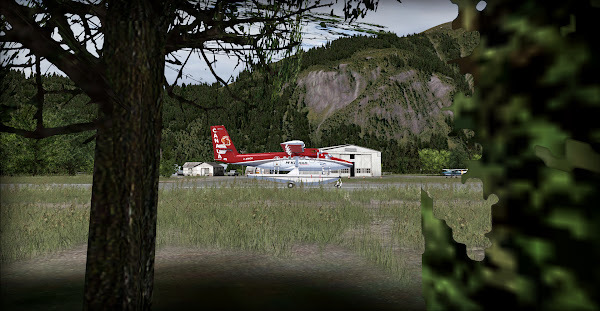 Seaplanes and amphibians can fly to Alice Arm (CAC3), Kincolith SPB (CBA3) and seaplane bases around Prince Rupert. There is no border control or customs at the airport so technically you should not fly to any Alaskan airport directly (the closest airport with customs control is Prince Rupert). 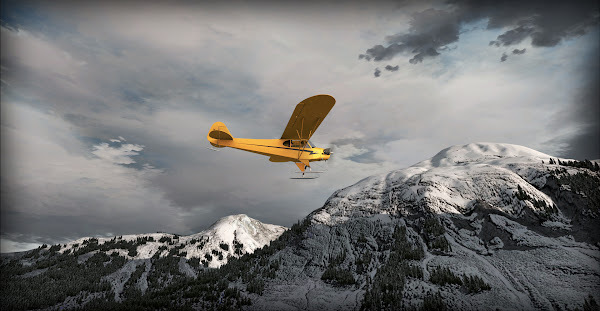 I do not care that much about the real world border crossing rules and I frequently fly to Ketchikan (PAKT – read my 6-star review), Annette Island (PANT), Wrangel (PAWG) and Petersburg (PAPG). There are many other possibilities in FTX Pacific Fjords and Tongass Fjords sceneries. 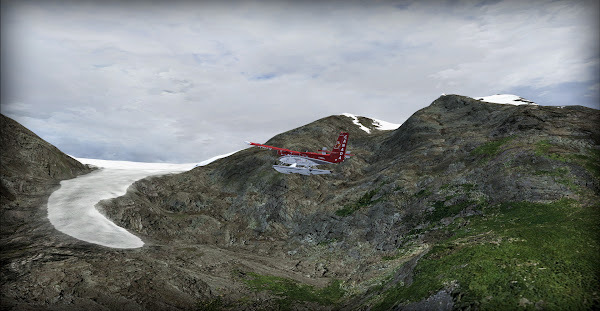 RTMM can give you even more destinations – an interesting Ice Station is located in Cambria Icefield close to Stewart. An airport like Stewart is usually a base for bush pilots. 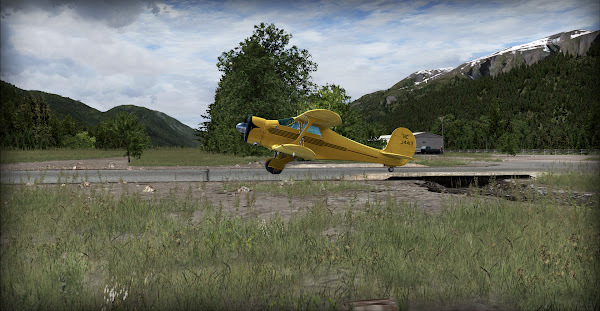 You do not need a runway to land – Piper Cub, Cessna 185 or a simillar plane will land on a road or on a sand bar. Just keep in mind that a sand bar near the mouth of the river usually is muddy – it’s better to land somewhere up the river. 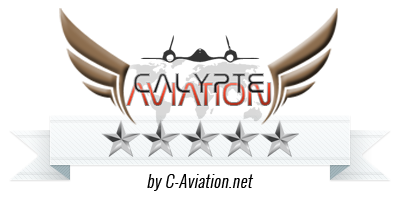 The product page – Stewart Airport redirects to the FlightSimStore where the scenery costs 29.95 Australian Dollars ($21 U.S. or 19 Euro – October 2015). 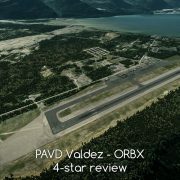 ORBX installer requires product key, order number and order date before it installs the scenery. 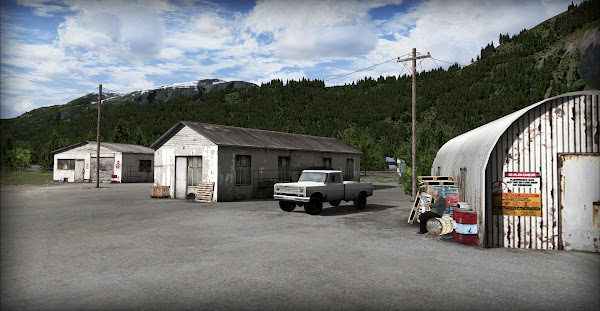 Apart from that everything runs automatically – the scenery will be placed in the Scenery Library by the FTX Central (which also checks for updates). PDF manual describes installation, recommended configuration (read this – some parts are actually important), recommended autogen settings. It also explains how the configuration panel works – it sets the desired amount of snow on the airport. 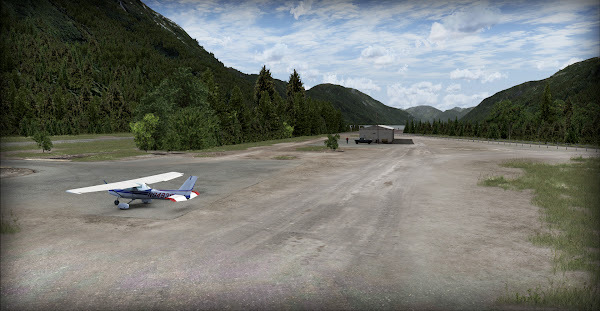 The main subject of this scenery is the airport – Stewart (CZST). The area around it (a few miles in every direction) is covered with photoscenery that seamlesly joins the FTX Pacific Fjords. Both Stewart and Hyder towns are recreated in detail. 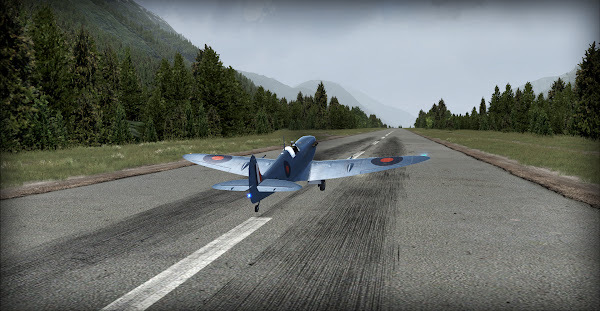 I’m in the middle of nowhere… The runway could use a repair – there are cracks everywhere. Fortunately the approach path was cleared of trees… but they did not do this completely and I passed really close to the trees that were left. The appron does not look better. The first thing I noticed were the warning cones around a hole in asphalt pavement. Nice of them to mark this part, but someone could move his … and repair it! And then there are the airport building. 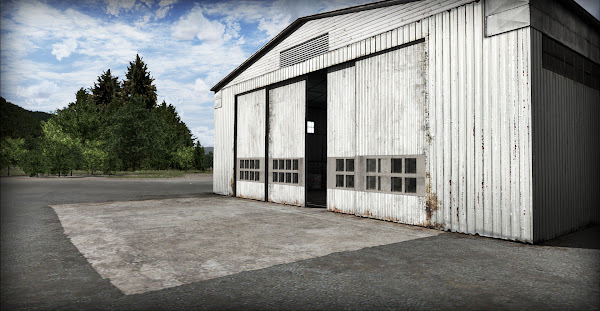 A rusty hangar, a shed made of corregurated steel and two buildings – both old and shabby. Some windows had been broken so the owner put a plywool boards as a temporary fix. From the looks of it – many years have passed since. A man sitting in front of a shed did not look at me even once as I was taxiing – there must something very interesting in this paper he reads. Another man is walking around – he seems interested about what is going on around him. 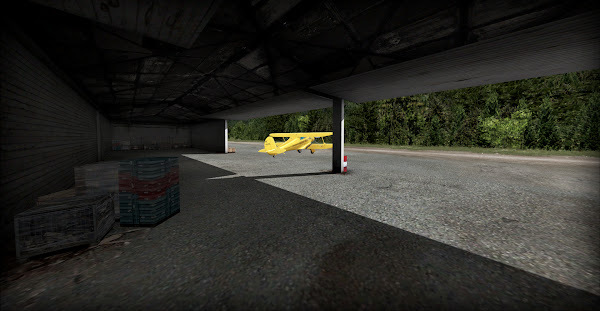 I decided to move my plane to the open hangar on the other appron. As I enter it I notice a culvert under the taxiway – ground modeling in this place is extraordinary! I can see details of the curb and a ditch that stratches along the runway and gets deeper where it passes underneth the taxiway. I am impressed with everything I see around me. To show you what kind of a scenery is it I will organize my description a little. Photoscenery coveres the area of about 3 miles in each direction from airport including Stewart, Hyder and a part of Cumbria Glacier. The mouths of Bear and Salmon rivers are also covered by aerial imagery. 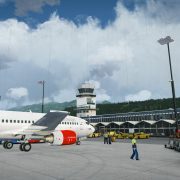 The scenery uses 60cm/px images (which is a standard resolution for the area surrounding the airport) and 5m mesh – that is better than the usual mesh resolution around a payware airport. 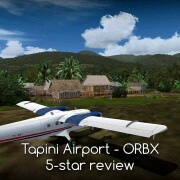 The airport is created in an unusual way – with several textures of varying resolution. Resolution in parts of this airport reaches 2cm/px (!!!). 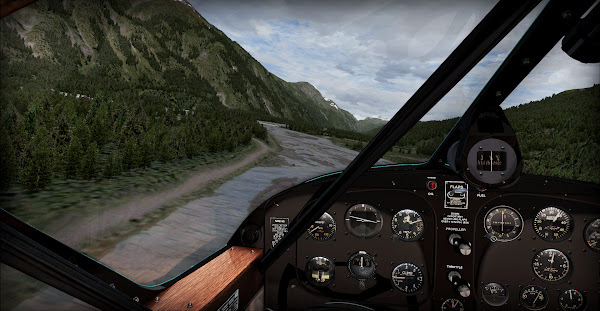 That makes this textures the best I have ever seen in FSX. 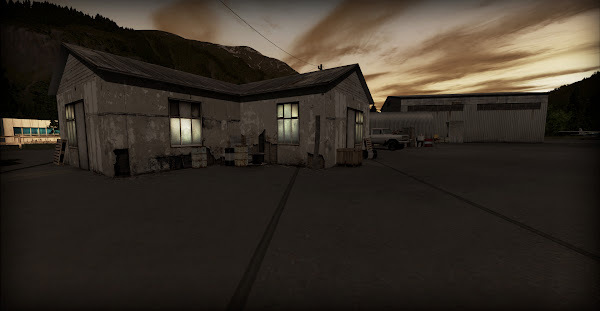 All buildings on this airport are detailed (3d model) and covered with a photoreal textures. I do not know what the resolution of this textures is but I can say that even from a close distance they look perfect. What I like about these buildings is how realistic they look. I do not have the feeling of being surrounded with toy models – instead I see buildings that look like they really belong to this place. Some buildings have their interiors modeled. For example I can enter the hangar through the hangar door that is slightly open and then exit through the back door. Just look at this concept – it’s not a hangar where I can park a plane (the door are not open wide enough) and usually such a hangar would be closed and no one would bother designing it’s interior. In this case – the interior is there. Inside there are things that you would expect to see in a hangar. I met several people at this airport. All are animated and I have to say that this is an impressive animation. In this scenery I am far beyond the usuall FSX world of simple gestures. These people walk around and really move! 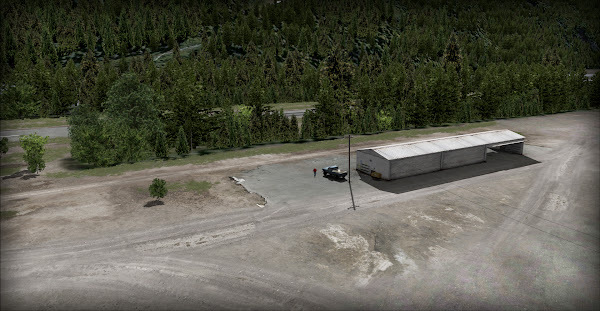 I have no idea how ORBX does this but their sceneries have perfect forests – the tree density is great. Buildings in both towns are correct. 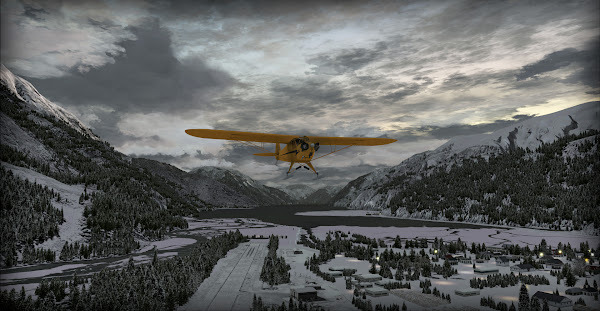 I can hardly find them good looking – I can not say that this towns are particularly breathtaking (in the real world) but I am sure that they are recreated in FSX just as they should be. Some trees around the airport are animated – they move in the wind. I like that! There are 3d stone models laying on the ground! The airport is covered with a volumetric grass. Both features are perfect. Just take a look at my screenshots and admire the grass. 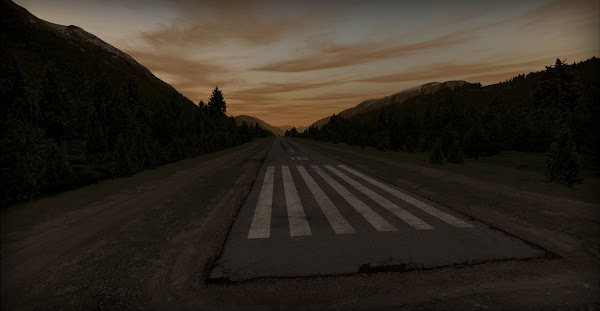 ORBX (or Russ White who created this scenery) used an interesting technique here – shadows are permanently baked. They look particularly impressive on a sunny day. Even a telephone pole casts shadow on the ground – and the wires too. 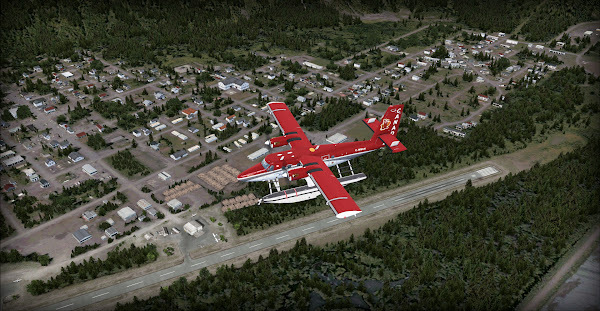 Compared to standard FSX shadows – it looks great… on a sunny day. I think that there should be an option turning shadows off. But I should not be too harsh – it’s not a problem even on a cloudy evenign. And it’s a huge quality on a sunny day – no matter which direction the sunlight comes from. Winter textures are perfect. 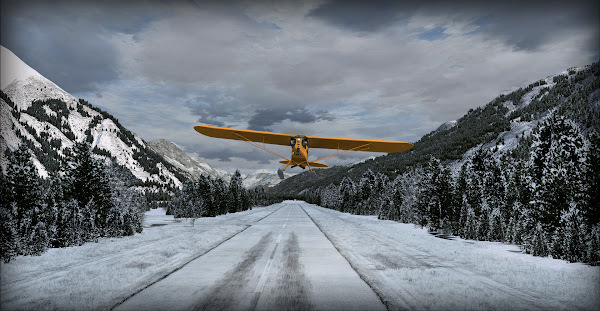 I rarely fly in winter in FSX as most developers can not correctly “place” the snow in their sceneries. It is different here – snow covers buildings, runway, aprons… it’s everywhere – even on the roof of the pick-up truck parked at the airport. 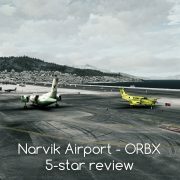 I like how ORBX uses small objects in their sceneries. Here they look especially good. 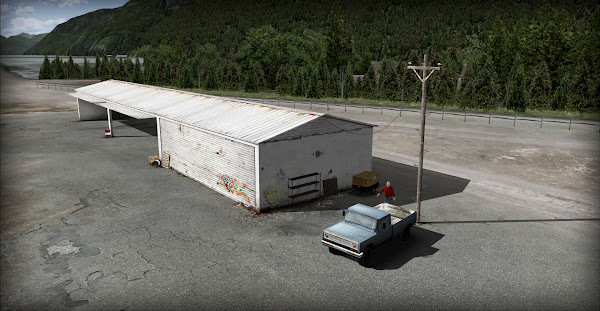 I already mentioned the telephone pole – it’s perfectly modeled. A generator, some crates and even such insignificant details like the corregurated steel sheet resting against the wall are modeled carefuly and placed imaginatively. I was surprised how light the scenery was. 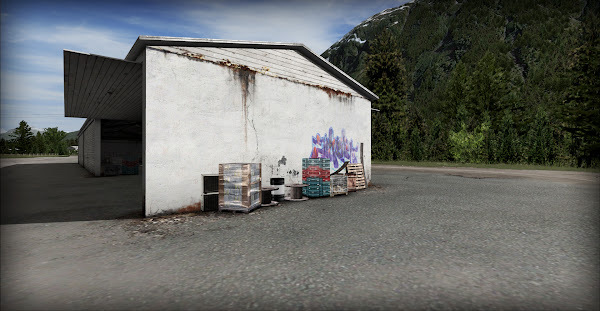 After Bella Coola I expected something frame rate heavy. 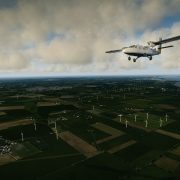 Here – nothing bad happened – I fly at almost maxed out settings (in my PC I can not go over Autogen density 4 here) and the framerate is acceptable. 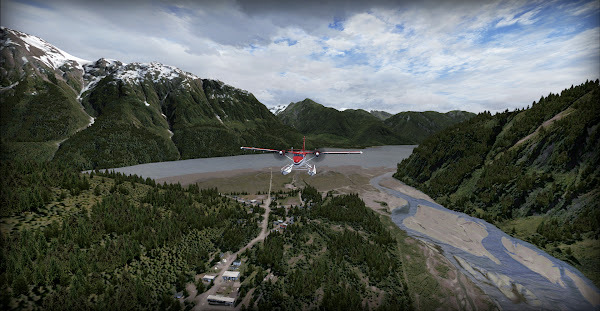 Usually I have 30fps when flying over this scenery in advanced GA planes like A2A Cessna 172 and Aerosoft’s Twin Otter. Sometimes my framerates fall to 20, 22 or 25fps. 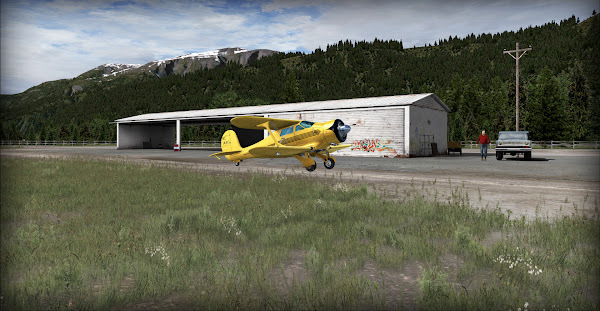 The scenery is very good – it nicely captures the beauty of Stewart’s surroundings and perfectly shows the small town airport in the middle of nowhere. It has no flaws and many advantages. I recommend it strongly! For 19 Euro or 21 USD there is a beautiful scenery. I consider it a very good price for this product.